Pumpkin and spice are besties as we are all aware. #pumpkinSpiceEverything amirite? But I am not talking about the famous latte here I am talking cajun instead of cloves. Spicy cajun seasoning to be exact. In this dish you have sweet apple & gouda chicken sausages, cool and creamy pumpkin puree, and spicy cajun seasoning. Throw in some pasta and cook it up in one pot and less than 30 minutes you have dinner. Winner. Winner. Thirty minute meals have been a life saver for me. Remember last month when I pledged to skip the drive thru and cook from home? Did you challenge yourself to eat at home too? How did you do? Well I did dine out a few times last month (it was my daughter’s birthday). We only had fast food TWICE as a pick-it-up-on-the-way-home-from-soccer convenience. Twice in 31 days isn’t too shabby. As a child I can’t even think of a time where my parents picked up fast food for dinner. Occasionally we would order pizza. But fast food? Never. For my family fast food is going to return to a special treat (like when we are traveling) and in order to do that I need to arm myself with quick and easy recipes. I love to be in the kitchen whipping up masterpieces however that is not doable every night. Meals ready in 30 minutes or less, like this pasta, are going to become the norm around here. Tell me how often do you pick up fast food, take-out, or pizza each week? Jamie from The Kitchenarium is a participant in the Amazon Services LLC Associates Program, an affiliate advertising program designed to provide a means for sites to earn advertising fees by advertising and linking to amazon.com. I will get a few pennies from your Amazon purchase (no additional cost to you). Thank you for supporting The Kitchenarium! Heat a large skillet over medium heat. Sautee shallot and garlic in oil for 3 minutes. Add in sliced chicken sausage and brown for 5-7 minutes. This sounds fantastic! Yummy! I will be over in 10 minutes, LOL! Thanks Leah. I think we need a Omaha bloggers potluck happening! You had me at “one pot”. I also try to skip the drive through, but pizza delivery is a regular Friday on the couch kind of dinner. I make a LOT of one pan dinners. One that is super popular in my house is a pasta dish with smoked sausage, tomatoes and cheese. I make it way too much, so I’d love to add this dinner to the rotation! I am heading over to check out your one pot dinners. Fast food is a treat in our house … and like you said, mainly when we’re traveling. I love the sound of this combination. And I’m pretty sure I have everything in the cupboard to try it out! Thanks Noel. I am looking forward to it being only a treat –we used it as a crutch for busy nights far too many times this year. Mmmm….that Cajun Pumpkin Sauce! Looks so delish!! Gotta have as much pumpkin as possible during this time of year! 🙂 I absolutely love how fast this comes together too! Pinned! Thanks Anna! Quick dinner for the winner! I love one pot pasta recipes. 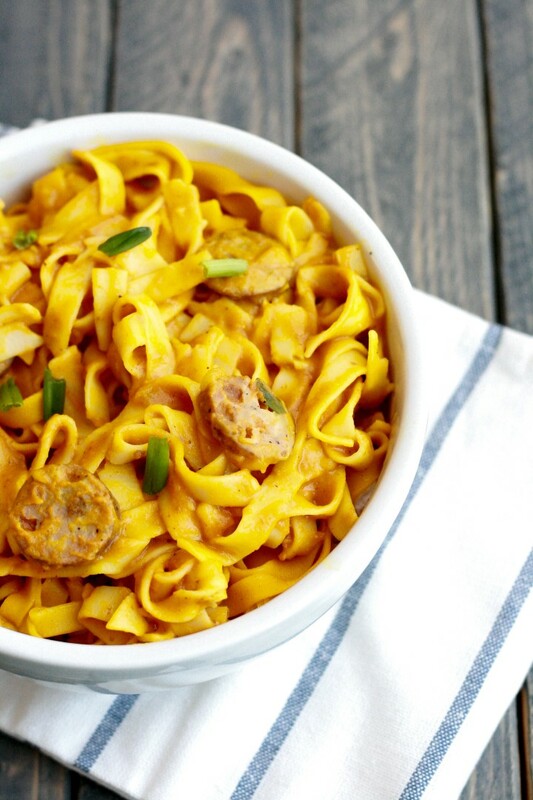 And this pumpkin pasta seems like the perfect fall dinner option for me. yummy !!! Perfect fall dinner is true. Thanks for visiting Revathi! QUick and easy recipes like this one will definitely discourage you from the fast food stops! 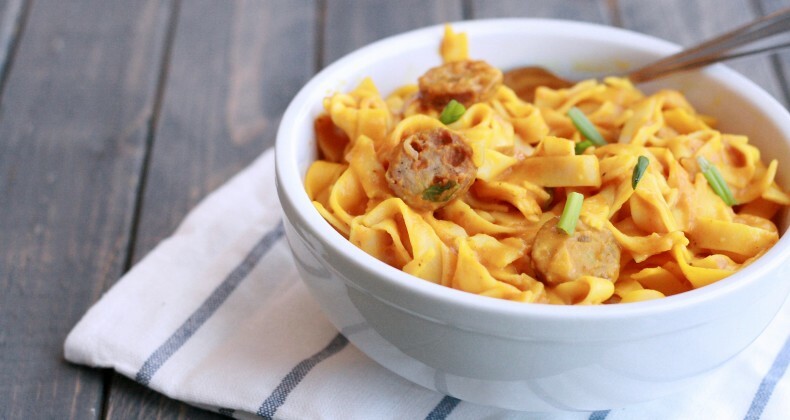 This sounds great — love the fusion of flavors : )) A perfect fall themed pasta ! What a great combo of flavors! I really need to go and make this right now. Thanks for sharing! Thanks for stopping by Rachel. It looks delicious!! Perfect for weeknights. I’m trying your recipe soon. Ooooh, love savoury pumpkin dishes! This looks divine! This is so great – love finding new pasta recipes!